Our customers are the most informed sales personnel we could ask for. 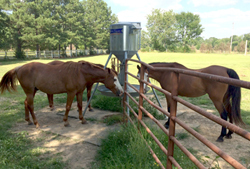 Our Customer Referral Program rewards you for telling others about your Feed Smart feeder and how it solves the many issues associated with feeding your horses. If you have purchased a Feed Mart Automatic Feeder and you refer someone to us and they purchase a Feed Smart Automatic Feeder, we automatically send you a check for $100.00! It's that simple. We screen all calls and emails to determine exactly how new customers learned about Feed Smart feeders. We know that the Feed Smart Automatic Feeder is a proven product because we have used it with great success. But don't take our word for it. Here is what some of our customers have to say about the Feed Smart Automatic Feeder. My Feed Smart feeder is the best product I have ever purchased. Not many products lead to the extension of the life of a user. That is what I can say, without a doubt, my feeder has done. I have a geriatric horse (Summer) that was not in good shape. She had an abscessed tooth that prevented her from eating. The vet came and fixed the tooth, but told me she would have to eat soft feed at least twice a day or she would die. She does not have enough teeth to get any nutrition from hay. Given where I work, and living, alone that was going be a problem. Luckily, I found online Feed Smart. Not only was it a great value, it has proven to be just what the vet ordered. She now gets four helpings of feed a day, which works wonderfully with her digestive tract. I do not have to feed as much because of it. The Mocks also recommended the type of feed needed for a horse in her condition. The company was great to work with and willing to do what was necessary to get my feeder set up. They are responsive to any needed help after the sale, as well. For example, they gave me advice on how to set up the feeder for my other horses, making sure Summer still gets her allotment. 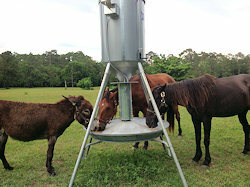 I have to say it again: "My Feed Smart feeder is the best product I have ever purchased. I have 2 of the Sr. feeders. One for 2 years now and one for a year and a half. Both have been exceptional tools for me and my 8 horses. 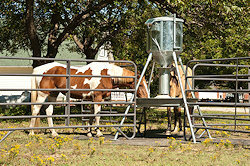 It is such a relief to know the 4 old horses (27-34 years old) on the one feeder are being fed 5 times a day. It is so much better for their digestive systems. They are very happy and in good flesh. I can also be confident my horses are being fed exactly on time every feeding if I happen to not make it home in time some afternoon or evening. Not to mention those really cold weekend mornings when you'd like to just roll over and get some more zzzzz's before starting the day. No problem..... the horses are being FED. My only regret is not having learned about them years ago. Hi Suzanne, I just wanted to Thank You for all your efforts. 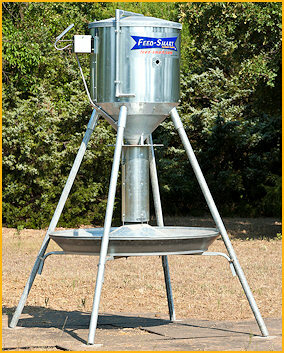 We purchased the Feed Smart Feeder several months ago. We have gone from dragging feed tubs all over the pasture to just enjoying the pleasure of watching the horses. The set-up was extremely easy with the instructions provided. The Automatic feeders have been very reliable. We feel this change has been a huge benefit to the horses. They maintained the weight, by eating several times a day. The programmer is very accurate. I have recommended this product to our friends, who have purchased from you as well. We all LOVE this product. Most of all, I feel that your Customer Service is the BEST I have ever experienced. You are very prompt in getting answers to any questions that we have had. This has been an awesome experience!! I have my feeder now for almost a year and do like it very much. The battery is still at a 100% charge and the timer performs flawless. The horses have adapted well and know their feeding times by routine. 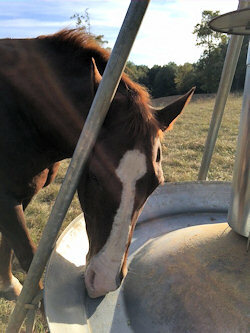 The feeder has giving me peace of mind that the horses get their nutrition with me not being at the ranch all the time. 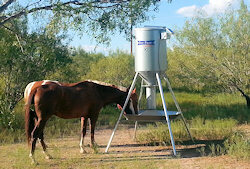 I am very happy with the purchase and highly recommend this feeder for the busy horse owner. Suzanne - We set it up with the sheep. We will add a bar between the legs to keep the rascals out of the trough. Currently it is dispensing whole barley. Now we can feed 3 or 4 times a day as most research believes is better than the once a day schedule. The whole assembly was very easy to set up and program. My help says "best thing since sliced bread. We are anxious to add more to other livestock pens. Here is Captain, who loves the feeder. He knows exactly when it will drop. This saves us a lot of gas money as we live 30 minutes away. We plan on building here soon but meanwhile it sure has been nice. This feeder actually paid for itself. We have had this Feed Smart feeder for over 3 years now. This has been the best thing we ever purchased for Captain. Besides saving us a lot of money in gas, we have the peace of mind to know that he is being fed. He knows exactly when his food will be there. We are finally building this year but would never go back to bucket feeding again. The solar timer is great! Donnie and I cannot say enough good things about this feeder. Your customer service is also great! We appreciate your assistance in the past years with any questions we have had. Thank you again for this wonderful feeder! Just wanted to say thank you for the excellent product & excellent service – We're now having the peace of mind knowing that our horses are being fed on time even when we aren't at home - Thank you again. Thanks so much for the wonderful feeder. My poor keeper is looking better already! I love knowing they are fed every time and in a better way for their anatomy. I so wish I had this feeder years ago. 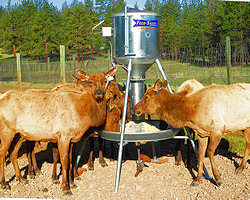 US Forest Service – Staff in Oregon reported that elk herd adjusted quickly to the feeders and have shown improved body condition with regulated feedings. I am LOVING my Feed Smart Feeders. 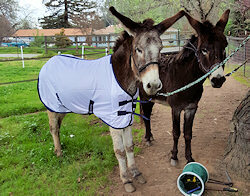 They're probably the best purchase I have made, as it makes feeding the pastured horses SO convenient. I am off the clock and this frees up my time so that I can check on those horses on my schedule. The horses look great and get along well at feeding time. I bought 2 and see a 3rd one possibly in my future. We are very happy with the feeder. The horses look really good and they seem quite satisfied. They are doing great and look better than ever. Blossum, Rocket, (our horses), Susan and myself are absolutely ecstatically happy. And it's all thanks to your Feed Smart feeders, and your love for horses. There are no words to convey the peace of mind that you have given us and our horses. We would be more than happy to endorse the feeders. A million thanks wouldn't be enough... Thank you.